This is a 1978 2-page ad for a Duncan Hines Cakes featuring recipes for: Cinnamon Streusel Cake, Chocolate Chip cookies, Sock-it-to-me Cake, Fast Fixin' Chocolate Chip Cake, Lemon Supreme Pound Cake and Double Pineapple Upside Down Cake! The size of the ad is approximately 11x17inches. 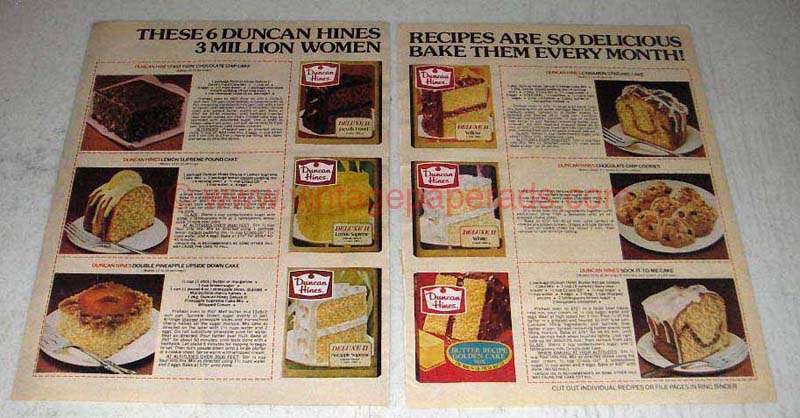 The caption for this ad is 'These 6 Duncan Hines Recipes are so delicious 3 million women bake them every month' The ad is in good overall condition, with some light wrinkling. This vintage ad would look great framed and displayed! Add it to your collecction today!